Every kid wanted to be an astronaut, while young girls wanted to be stewardesses, so Quickspin decided to make their dreams come true. Buy a Ticket to the Stars and enjoy this space-themed adventure built on the layout with 5 reels, 3 rows, and 25 fixed paylines. Spend a vacation of your lifetime on a distant planet and earn Multiplier Upgrades, Wilds, Free Spins and much more. Want to start exploring the universe? 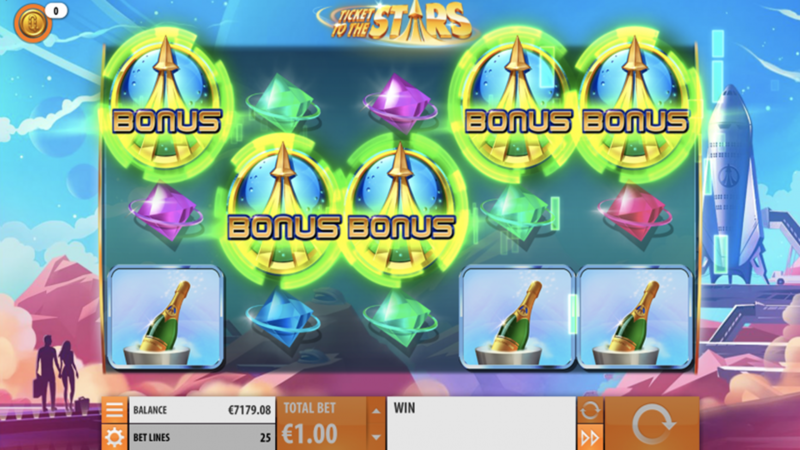 Arm yourself with knowledge after reading the Ticket to the Stars slot review. Want to see how Ticket to the Stars works? Select a recommended casino site from the list below and start playing for free or real – our screenshots will give you a sneak peek! At the early beginning, the system will ask you will you play for fun or for real money. The good thing is that the Ticket to the Stars Free Play mode has more than enough demo credits not only to work steadily on your betting strategy but also to learn how to win and make no real money investment. Now, back on track: try to collect 3 or more matching symbols placed from the leftmost in order to get paid. Being a themed game, this one puts much trust in symbols closely related to the subject, so the paytable will favor Suitcase and Champagne better than shiny and colorful gems. Naturally, the Astronaut and Stewardess have the highest payout rating and bring the highest prizes for combinations of 3 to 5 of a kind. Consecutive winning combinations lead to the Mega Win, Super Win, or even an Epic Win, while every 3rd win can trigger the Ticket to the Stars Bonus feature. Thanks to the Multiplier Upgrades, you can get the winnings boosted up to 9x while collecting 2 extra spins along the way. When it comes to the betting strategy, the game takes good care of both those on a smaller budget and players willing to invest more in order to collect a big win. Practically, the coin value ranges from €0.01 to €4, so you can wager between €0.25 and €100 per round. When you accumulate enough Multiplier Upgrades, the game will grant a batch of 15 Ticket to the Stars Free Spins. This round also follows the rule of the base game, but removes any limit from the Multiplier, meaning you can keep scoring over and over again, while the Multiplier amount is getting bigger and the extra spins keep coming. 3. What is the RTP factor of Ticket to the Stars? According to official info by Quickspin, the RTP value is 96,52%. Introducing space tourism as the next big thing, the game has what it takes to attract players of all experience levels. Is there anyone who wouldn’t like to increase an already sizeable Multiplier or benefit from a plethora of Free Spins? We thought so. Just grab the Ticket to the Stars tips before the adventure actually starts.